ICH Blog: Oral History, Coffee, Love, Questions and More! Oral History, Coffee, Love, Questions and More! 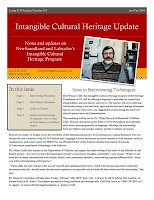 In this issue of the Intangible Cultural Heritage Update newsletter for January and February 2010, we announce an introduction to interviewing techniques workshop with Dr. Philip Hiscock; a review of websites with sample oral history questions; The Rooms brews up coffee, culture and stories of love with visiting storyteller Mary Gavan; and, Dr. Anna Kearney Guigné hits the road with workshops for community organizations planning folklore and oral history research projects.